I'm hardly a wrenchhead, but I do know something about cars. I know the purpose a carburetor. It combines gasoline and air creating a highly combustible mixture, that powers the engine and regulates the vehicle's speed. Norway's The Carburetors does something of the same on their latest offering Laughing In The Face Of Death. They combine heavy metal, hard rock groove, a dash of punk, and a whole speed, and then light a match for their assertive sound. The Carburetors jump from the starting line and basically go full throttle to the end of this album. They do it using the twin guitar attack of big riffage and roaring solos, driven an aggressive no nonsense pummeling rhythm section. Vocalist Eddie Guz has a forceful delivery, equal parts snarl, rasp, and Jim Beam. Fundamentally, The Carburetors play heavy metal rock n roll. Yet, they have this punk edge, I'm hearing from the simple raw and sharp delivery. The album was essentially recorded live in the studio, which may account for this. So then The Carburetors remind me of a mash up of Motorhead, AC/DC, and strangely Foghat. I think the last comes from the slide guitar within Water Into Wine. Then there's a song like Shot Full Of Noise (listen below) which sounds like a stew of simple rock, fast punk, and slight rockabilly. If it was a little less sharp and loud, it could have been a song heard in 1957. If there's any dilemma with the album is that it's predictable with all the flurry and speed consuming every song. Sure The Undertaker has this small low key start. Then there's the closer, (Tonight We're Gonna) Die Like Heroes, which lighter and slower, only voice and piano. Actually it doesn't make much sense with the rest of the album. Otherwise, if you like your heavy metal fast, sharp, and loud with lots of guitars and an abundance of groove, you'll like The Carburetors' Laughing In The Face Of Death. 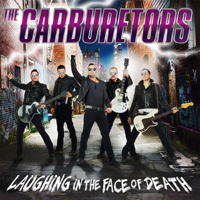 If you like your heavy metal fast, sharp, and loud with lots of guitars and an abundance of groove, you'll like The Carburetors' Laughing In The Face Of Death.